Katie Wallace has never given much thought to 9/11. She was only a year old when terrorists struck American soil. But now her dad has landed in a mental institution after claiming to know what really happened. He insists the attacks were part of a government conspiracy. And he claims that Katie is living proof: the lone survivor of a massive cover-up. Hoping to free her dad, Katie sets out to investigate his bizarre claims. 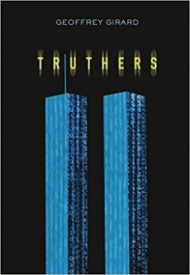 Soon she's drawn into the strange and secretive world of 9/11 conspiracy theorists known as the Truthers. Wading through a dangerous web of fact and fiction, questions and distortion, Katie no longer knows what to believe. But she does know that she's being followed--and that someone is determined to stop her search for the truth. Scott Wallace prefers to live life in a fog. Alcohol, drugs, and conspiracy theories fuel his existence, and his daughter, Katie, has had to be the responsible adult in their two-person family for far too long. At seventeen, Katie should be worried about things like prom and her grades, but when her dad is hospitalized after freaking out at work, Katie is placed in foster care and visited by government figures who are obviously hiding things from her—as is her dad. When Katie tries to find a lawyer who will help get her dad out of the institution where it appears he is being heavily sedated and perhaps tortured, the only one who will take her seriously gives her the task of researching her dad’s situation and his claims that the US government was behind 9/11. The best path to secure his release is to prove that 9/11 conspiracy theorists (Truthers) are not insane, and that their beliefs are plausible. Katie’s search for answers—or at least a legal path to getting her dad released—takes her from a law library to interviews with men who served in the military with her dad and even to a Truther convention. Along the way she meets a helpful (and cute) genius, and she enlists the help of an odd assortment of characters including her best friend and the other girls in her foster home. Katie is a likeable character, and her adventure reads as surprisingly realistic. Although there is a lot of necessary explaining throughout the book, there is also plenty of action to balance that, and the plot will keep readers wondering and flipping pages. My only complaint about the book is the occasional perspective shift that--though I understand the reason for it--disrupts the flow of the book. Fortunately those interludes are brief, they serve their purpose, and I was able to recover and quickly immerse myself in Katie's story again. I found myself taking the book with me everywhere I went so that I could tear through pages with every spare moment. Geoffrey Girard has put together an interesting YA novel that has history, mystery, romance, action, and intrigue. I think teens will really love TRUTHERS, and the book will prompt them to question (and hopefully research!) accepted explanations for everything out there. My thanks to the publisher for an advance copy of the book in exchange for my honest review. History, mystery, romance, action, and intrigue--all in one! So, I've said before that for some reason I love conspiracy theories. Do I believe any of them? No. I don't but they are interesting to look up. So when I saw this one on NetGalley, I had to get it. I learned nothing new from it but someone who knows nothing about the the conspiracy that 9/11 was an inside job will learn lots. This actually leads me to the first problem I have: info dumping. It got pretty boring in some parts of this book for that reason. I get it, she would go look up all these things and it made sense for the info dumping but it didn't make it any less boring. Also the drugs... I'm not a fan of drugs and her father was big into weed. I pushed past that because I'd never seen a YA book like this one before and it does make sense why he did it but I still don't like that. Overall, this is a good book for anyone who likes 9/11 conspiracy theories.